Add a jack: Add remote A/B switching jack $75 (specify left or right side in order COMMENTS) [Add $75.00]Remote channel switching option, mono jack. You can still use the A/B switch when not using this remote jack. No Y-Cable- INSERT Y-cables are used for patching into a send/return effects loop jack. Stereo end plugs into the jack, and the two mono ends are the SEND and RETURN. Add a Foot Controller: Add AMAZE1 tap/mod/preset controller, and free 18" stereo angle or straight connecting cable $150 [Add $150.00]We have these with straight or angle ends, add a note to the comments area if you have a preference. 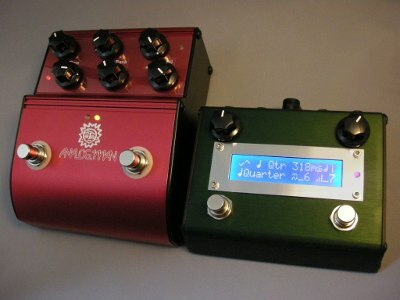 The Analog Man ARDX20 Analog Delay pedal is a 100% handmade analog BBD chip delay. It has two channels, each with independent delay time, feedback, and level controls. Also has effects loop, delay time expression control jack, and hi-cut switch. 2019 - We finally caught up with back orders, have plenty in stock and should be able to ship new orders out right away except with mods which can take a few days. The AMAZE1 tap tempo/preset controller is now available and in stock. In early October 2014 we came out with the new "flat box" version of the ARDX20. The new version uses a custom "hammond style" box for lower profile. The ARDX20 takes the great sound of our previous single AR20DL analog delay, but adds more features. This pedal was released slowly, with no hype or advance promotion, so that we would not get into a back-order situation or have to fix problems in early versions. They are still sort of "under the radar", but with over 2000 (6/2012) ARDX20 pedals out there now, this pedal is ready to take off! This delay was designed for ease of use and the best sound possible, with standard features everyone can use, but optional external features for things everyone may not want to pay for up front. The external options like tap tempo, modulation, and presets is an additional AMAZE0 pedal with a computer in it to control this delay. It's trivial to make an analog delay that has very dark repeats, as the noise which is the problem with analog delays is filtered out along with the high end. To make the repeats have good fidelity without excessive noise (like the Deluxe Memory Man) is difficult, especially with the newer low voltage delay chips, but we have tuned this delay for high fidelity repeats and kept the noise very low. If you want less high end there are ways to get that (which also reduce noise). 1. True bypass switching, the right side foot switch is effect ON/OFF. 2. It's ONE delay pedal, but has TWO sets of controls, not only delay time but also delay level and feedback. YELLOW channel (upper 3 knobs) or RED channel (lower 3 knobs) are selected with the left foot switch. 3. Battery or normal 9V boss type power. Power jack in the center top. 4. Battery compartment on the bottom for quick and easy battery changes (round version). 5. Low power consumption, 15mA, so an alkaline battery should last about 30 hours of use. 9. EFFECTS LOOP is next to the input jack. Use a Y-cable (insert cable like optional HOSA STP-201) to run an effect only when the delay is ON, and only on the delayed signal. The dry sound will stay in the pedal, it won't pass through the effects loop. Modulation pedals are cool here. The E-H FREEZE pedal is amazing in the loop! Or use a VOLUME pedal with a Y-Cable or an expression pedal to control the level of the repeats. Pulling back all the way will kill the delay sound. You can also control the FEEDBACK somewhat, as lowering the repeats volume will reduce the feedback so you can easily control infinite delays. 10. DELAY TIME EXPRESSION jack is next to the output jack. Use a normal Boss EV5 type expression pedal to control the delay time of the RED channel. This jack is also used for external options including tap tempo, modulation, multiple delay time preset boxes, etc. The Boss FV500L is a stronger, bigger expression pedal which we also carry. We also carry the Ernie Ball 6181 volume pedal which makes a GREAT small, heavy duty expression pedal (requires insert Y-cable). 11. 600mS (.6 seconds) analog delay time, with clear, not dull, delay sounds. But not clean and bright like a digital delay. Most of the units actually get 650mS if you measure them. The delays are easily controlled for infinite feedback without runaway volume problems which can damage your speakers. 3:00 on the feedback will usually provide easily controlled infinite repeats. Minimum delay time is 36mS. Uses two select 3205 chips for best delay at 9V. 12. You can plug into the EFFECTS LOOP to get a WET ONLY sound, when the pedal is ON. You will need a special cable- the ring on the delay side always connected to the tip of the output cable. a) Attach the tip and the ring together on the pedal side to allow feedback (repeats). If you do this, the normal output will work normally, with both wet and dry, so if you want only DRY* out of the normal output, turn the LEVEL knob down to kill the delay on the normal output. The LEVEL knob does not change the volume coming out of the FX loop. So the WET output will be very loud. b) Ground the tip on the pedal side (kills noise) if you don't want feedback (multiple repeats). You will have dry only out of the normal output. You can alternatively plug a normal cable half-way into the EFFECTS LOOP jack to do this but it's a little tricky to get it just right so if you want to do it often it's best to use a special cable. We have these cables for sale HERE. 13. Two LED lights blink in time to the delay setting. 14. New flat version has an internal DARK switch to reduce the high end on the repeats. The dry signal is not changed. The miniature sliding toggle switch is on the back side of the circuit board, it's the only switch you will find. This switch will also reduce the normal analog delay white noise, so if you need a quieter sound (like running it into a high gain amp which multiples any pedal noise) you can use it for that. 15. Handmade pedal, using wires and normal pots/jacks/switches, which allows anyone to fix it with normal parts. Not a disposable pedal like a factory-built pedal using tiny or proprietary (impossible to replace) parts. No surface mount parts on the circuit board, all through-hole soldered parts that are easily checked and replaced. We redesigned the boards and internal layout of the pedal to make them easier to build and more rugged. We tried to reduce the normal analog delay noise level too by arranging the wires and components, and using a board with more shielding. The wiring, boards, jacks, and LEDs are sturdier inside. We made one change to the circuit, putting a trimpot on the board for adjusting the maximum wet (delay) level. The stock setting is a bit louder than the previous version, and it can get a bit louder yet. But if you adjust it louder, the feedback gets more sensitive and you can have runaway repeats easily. The trimpot for volume of the repeats is marked RT6. PLEASE DO NOT TOUCH ANY OF THE OTHER TRIMPOTS as special equipment is needed to calibrate an analog delay. The REV3 pedals have a serial number over 1000 and a nicer plexi control panel with A and B labels. These specs carry over to the REV4 flat box version. This version is about the same except the box is flat for a look that more people like, and a lower profile to fit better on pedalboards. There is also a switch on the back side of the board for a high cut on the repeats. These have a louder delay output but you can turn it down as much as you want with the level knob. We can re-box your old round-box VERSION 3 ARDX20, into the new flat box. You can tell ver3 as all four jacks have a plastic nut, and the power jack is square. We can't do the earlier versions, sorry! REV1 had all four jacks with metal nuts, and rev2 had two black and two metal jacks. Our MOD FORM has that info (google will find it). There are some mods we can do on these if needed. We can put a capacitor on one of the chips to make the delays darker and warmer and reduce white noise. We can change the delay time expression jack to work on both sides. We can also change the FX LOOP jack into a second Delay Time Expression jack, for the yellow side. This would allow running an expression pedal or AMAZE0 on the yellow side in addition to the red side. Email for more info on mods on an existing or new ARDX20. We can also add a REMOTE jack for switching between sides, with the original AB switch still able to be used locally, for $85. Here is a video of that on Youtube. When you change delay time on an Analog delay, the repeated notes can slur a bit, a sort of portamento. This happens whenever changing time on any analog delay - turning the delay time knob, using the delay time expression pedal (see Gary Clark, Jr's cool use of portamento below! ), by changing channels on the ARDX20, or by using the AMAZE0 to change with tap tempo or program changes. An Analog Delay is like a tape echo or record player, you probably have tried slowing down or speeding up one of these and heard the slur as it changed time. If you don't like it, you can change delay time between notes but it can be used for cool effects too. Unlike most of the new sunface-size analog delays now available, and most larger units with long delay times, the ARDX20 uses vintage style normal-size electronic components that are hand-soldered to the circuit board. These are not machine made at a factory like others. We also use normal size potentiometers and switches that are hand wired. This means that the ARDX20 won't wind up in a landfill if something goes wrong- it can be repaired by anyone, while the factory made, robot-built surface-mount analog delays must usually be replaced if something fails or is damaged by an electrical or mechanical accident. We also feel that the normal size components will give you a better sound. The resistors may not make much difference, but the capacitors we use are not available in tiny surface-mount versions. Someone asked me for a comparison to the MXR Carbon Copy. Those are about the best small analog delays, and we sell a lot of them. The ARDX20 has quite a bit longer delay time, about 2:00 on ours gives you the 600mS that the MXR has. The MXR has more white noise in the background, and the repeats on the MXR are a little harder and harsher due to the extra high end, our repeats are a little softer and smoother, a bit more like the old Japanese analog delays. But the ARDX20 has more high end than the old Japanese analog delays. We also compared with the Boss DM-2W Waza, which has two settings, for low or high (Custom) delay time. In normal mode, it sounds a lot like our ARDX20 in tone and noise, but delay time is short (300mS). but has quite a lot more noise, about like an EHX DMM. Why does an analog delay sound so natural? One big difference between the sound of digital and analog, is the high frequency decay. A digital delay can have essentially infinite decay, at all audio frequencies. In nature, air absorbs high frequencies really quickly. It turns out that even the largest acoustic space, with a decay of tens of seconds at low/mid frequencies, will be limited to around 1.25-1.5 seconds of decay at 10 kHz or so. Having high frequencies that ring out for seconds ends up sounding unnaturally bright. The AMAZE0 Tap Tempo box is an external computerized controller box. It plugs right into the delay time jack with a stereo patch cord. No other box or switch will work with the ARDX20 for tap tempo. We have some cool features like modulation and presets in this external box which became available in 2011. The AMAZE0 controller will work on ANY ARDX20 pedal. Not sure if it will work on any other analog or digital delays yet but we may come out with new versions if there is a need. This was discontinued in late 2015. An analog delay works great on bass, as it has a warm low end and you don't need a lot of highs. Eric Johnson's bass player Chris Maresh has the ARDX20 on his pedalboard along with one of our chorus pedals. When Eric went on tour with his old bass player Kyle Brock, Kyle got one too! Gary Clark Jr. has been using his ARDX20 for some time. I finally saw him in the summer of 2012 and he was also using a KOT V4 and Astro Tone fuzz. He was also using a Boss EV-5 pedal as a delay time expression pedal. Gary did some tasty slow playing while gently rocking the controller pedal for a sweet bent delay sound. Here is a picture of his pedalboard in June 2012. Here are some videos of Gary using the delay with the expression control pedal in the intros. Chuck Garvey of the band moe. has been using his ARDX20 with the AMAZE0 controller since they first came out, for hundreds of shows. He also likes to use an expression pedal on his. Singer/songwriter Christopher Cross, also an outstanding guitarist, got a few ARDX20 pedals for his various boards in 2013. He said "I'm always searching for that elusive tone. Using your delay mono and the TC for my stereo spread is incredible compared to using the DL-4 for both. I have always used the Line 6 but I was losing my fundamental note. Now with your delay and the TC as the last thing in the chain it's beautiful. Nice and thick but much more articulate."